I'll just cojoin two 3FW cases for prototyping, but will get new 6FW cases if it moves towards production (think 6FW could work for the long toothed StereoPEQ - so a useful new size case to get into production). Inverting good for feedback explorations. Yes! I've been looking for an active standalone matrixmixer for ages! Count me in! Bumping the thread! I'm looking for a similar matrix mixer. Ah, it progressed and paused again - made 2 prototypes, but I personally wasn't feeling it with that current design approach. I've been pretty happy with the panel layout approach, but the physical arrangements of the circuitry behind is quite tricky. I'm actually using my proto at the moment, but really just as a stereo mixer with 2 aux sends. I'm always tempted by matrix ideas, but never gel with them in practice. Edit - realised I never put up a pic of the last proto, so here it is..
Kind of silly that I can design and build a whole prototype like this and then shelve it all - but I do learn along the way. Nice specs - balanced I/O, phase switches, quality components etc. But I would rather have more input channels, lose one output and turn the lower two into a L/R pair with pan controls. Yep, I'd have grabbed that in a snap! The 4x4 metalbox one feels kind of vanilla.... but looks to be the only available matrix mixer in frac at the moment. I could chime in, since I am a matrix junkie and I have the other prototype of this green wonder. There is something special with a pure matrix, allowing any routing combination, not presupposing anything about how it should be used. That is great for feedback experiments, additive CV stuff, complex fx routing etc. On the other hand, what you now describe, Tom, is more like a master mixer for the modular. It would indeed be convenient, but less a matrix. 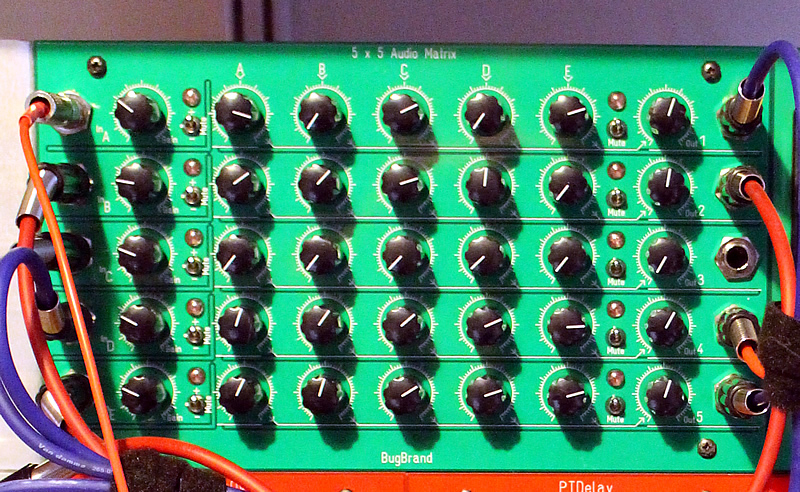 There are also matrix mixers centered around the LRpan paradigm, on all channels, of course. I use mine mostly for fx routing in my analog fx modular (all bugs). But I have also used it as a master mixer for the modular a few times. I have to agree that I work more and more with stero synthesis and processing, and then five is far to few, and mono sends wouldn't cut it either. Where's that 8x8 matrix monster you were working on a few years ago, Tom? I would love such a thing. Oh, and Allen & Heath's excellent matrix mixer, the Wizard 12m, has selectable mono or LRpan configurations for all channels - using the same knobs. I guess that complicates matters quite a bit. But it is very practical. In your green matrix, Tom, I appreciate the input and output levels. Phase is not so crucial to me (except for CV, but I think it is AC coupled, isn't it?). It matters in some feedback configurations, of course. I have said it before, and I say it again - I think you should start making this, Tom, in one form or another - also as a desktop unit, it would greatly help the "noise devices on a table" crowd, and they are quite a few. As well as make modularists happy! I definitely would like to see a standalone matrix mixer. I'm using a buchla 205 clone with various pedals but something that utilised 1/4" jacks would be better. On the modular side I always have 2 or 3 in my bugbrand setup and wouldn't want to live without them. otherwise who produces matrix mixers nowadays??? they're quite rare as standalone because they're normally embedded in mixing consoles...or am I missing something?